Davy and the Goblin, or What Followed Reading “Alice’s Adventures in Wonderland” by Charles E. Carryl. Illustrated by Edmund Birckhead Bensell: frontispiece, 13 full page black and whites and other b&w in the text. Published by Frederick Warne, 1886. 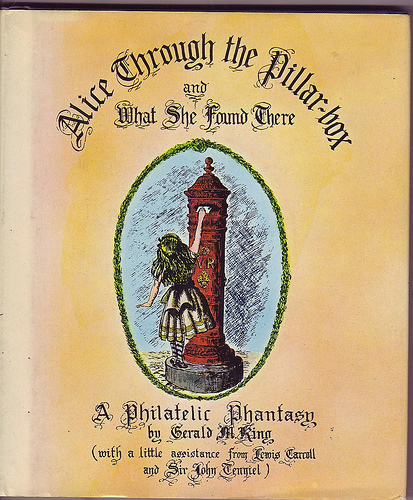 First UK edition (published 1884 in the US). Davy is reading Alice next to the fire when he gets sleepy. A Goblin appears in the fire, munching coals, and takes Davy on a “believing voyage” to the Sugar Plum Garden where he meets Robin Hood, Robinson Crusoe and Sinbad. Edmund Birckhead Bensell (1842 – 1894) was an American artist and illustrator. Charles Edward Carryl (1841 – 1920) was an American author of children’s literature. 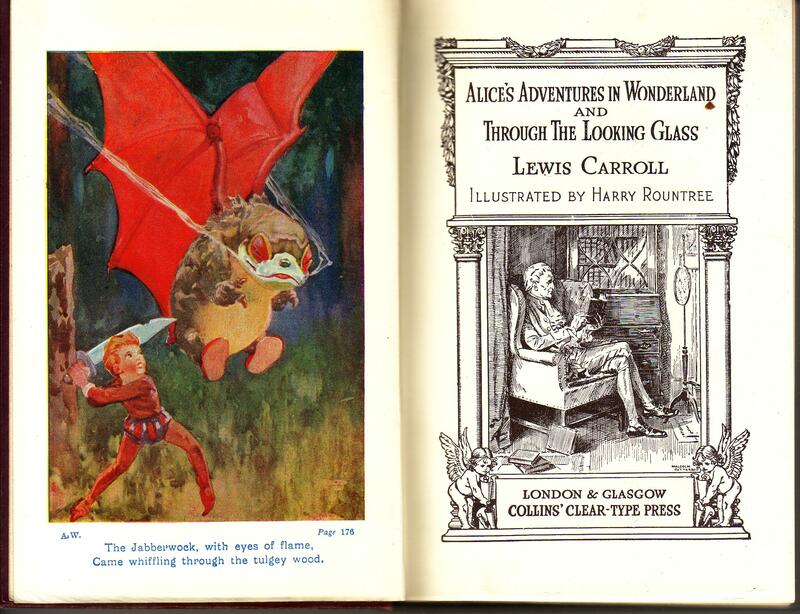 Apparently (so I’m told, anyway), the UK edition is pretty rare- with even the British Library having only the US one..
Alice’s Adventures in Wonderland by Lewis Carroll: illustrated by Harry Rountree. Published by Collins, date not known, but I think 1925. Small hardback book, no dustjacket. Harry Rountree came to London from New Zealand in 1901. He was 23 years old when he arrived, and he initially struggled. However, by the time he illustrated Alice (in 1908) he was a success. He re-visited Alice in 1925. 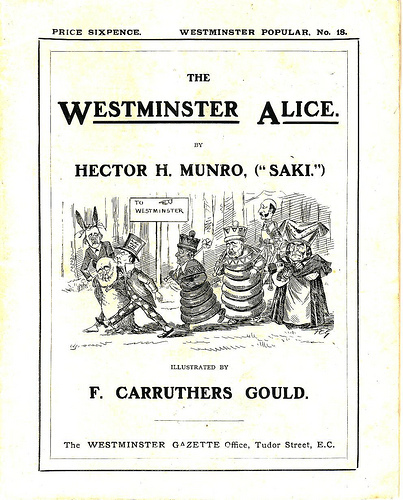 The Westminster Alice by Hector H. Monro (“Saki”). Illustrated by F. Carruthers Gould. Published by The Westminster Gazette, London, 1902. Pamphlet with lots of black & white illustrations using Tenniel’s as inspiration, plus four pages of ads at the end of the book: they’re rather fun- Jaeger, Turkish Towels and Pianolas. With apologies to Sir John Tenniel and to everybody else concerned, including Messrs. Macmillan and Co., Limited to whose courtesy we are indebted for permission to publish these political applications of the immortal adventures of Lewis Carroll’s Alice. A collection of 11 pieces satirising parliament and the political events of 1900-1902, when the initial enthusiasm of the public for the Boer War was fading fast and questions were being asked about the government’s handling of the conflict. When you really mean to stop. The first piece appeared in the Westminster Gazette on 15 July 1900 and the series continued until early 1902. The series proved so popular that the parts were issued together in this pamphlet. I think mine came from abebooks, but it might have been picked up in Marchpane Books in Cecil Court. Through the Broken Mirror With Alice by Maia Wojciechowska. Published by Harcourt Brace Jovanovich, 1972. 1st edition hardback with dustjacket. Armed only with a copy of Lewis Carroll’s “Through the Looking Glass”, a 12-year-old African-American girl named Alice is turned out of her Harlem foster-home with nowhere to go and sets out on a fantastic journey based on the classic novel. Does she have a wonderful imagination or is she mad? Alice meets transformations of the looking glass characters along the way : Alice, of course, becomes a pawn; the local librarian is the White Queen, the school history teacher is the Black Queen (“All the black ways around here belong to me,” the Black Queen says. “And all the white ways belong to me,” the White Queen adds) and the school principal and psychiatrist become Tweedledum and Tweedledee. 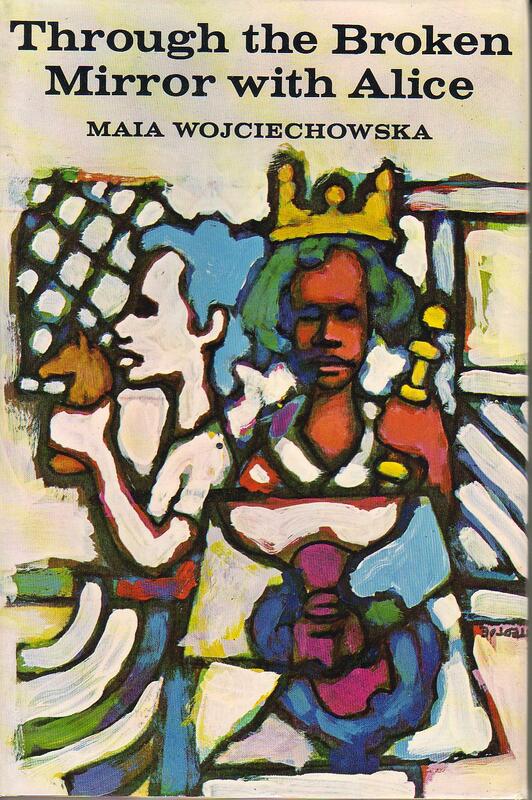 Maia Wojciechowska (1927 – 2002) was a writer of books for teenagers and young adults. Born into a military family in Warsaw, she spent some time with her family in France and England before settling in the United States. She has worked as an undercover detective, a motorcycle racer, a translator for Radio Free Europe, a copy girl for Newsweek, editor, and a bullfighter in Mexico before turning to writing. She was a friend of Ernest Hemingway and two of his wives. She won the Newbery Medal in 1965 with Shadow of a Bull.